Many sensor characteristics are computed for the entire image without regard for spatial qualities. Clearly the fine grained random distribution in the left-hand image is preferable to the vertical banding in the right-hand image. Fixed Pattern Noise (FPN), as the name implies, is noise that is in a fixed position spatially. 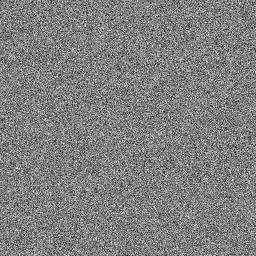 Examples of noise that are not components of FPN include read noise and Poisson noise. There are two primary components of FPN, Dark Signal Non-Uniformity (DSNU), and Photo Response Non-Uniformity (PRNU). DSNU is a variation in the offset of the pixel value when there is no illumination (black frames). PRNU is a variation in how the pixel responds to light (illuminated frames). We assume that a pixel responds in a linear fashion to illumination. So DSNU is the variation of offset and PRNU is the variation of slope. DSNU and PRNU are computed over the entire frame; and the two images above have identical DSNU and PRNU. So in investigating FPN we not only want to measure DSNU and PRNU but also to somehow characterize their spatial nature. During stacking pixels are stored as floating point values and as an average of the previous frames as opposed to a sum. Each time a frame is added the random noise of the accumulated stack is reduced. Notice that no matter how high the �gets, �cannot be eliminated. Given� �and for several frames we can perform a fit and compute �and . I have found that stack 16 frames is sufficient to get very good values. For black frames the �is DSNU and for illuminated frames the �is PRNU. PRNU is typically reported as a percentage of illumination (signal). I have chosen to report DSNU in both Digital Number (DN) and as a percentage of read noise which generally runs approximately 10%. Note that a side-effect of computing DSNU is that we also get a read noise value. I compare this read noise value against other sources as a sanity check. Similarly, computing PRNU allows an estimation of Full Well Capacity (FWC) and conversions gain. These values are also checked against other sources. In this article I demonstrated how we can determine DSNU and PRNU by using the flat field technique and an equation fit. One advantage of this technique is that we can examine the resulting stacked image for patterns rather than relying on a single number to characterize FPN. Visualization and further analysis of FPN will be the subject of a follow up article.